I love the summer time. Fruits and vegetables are ready to be picked and are as tasty as they are vibrant. One of my all time favorites snacks ever is strawberries and cream. Not only is it refreshing, but it is also healthier than most snacks that you can pick. Something about the tanginess of the strawberries mixed with the sweetness of the cream, it makes my taste buds explode. One day sitting at home with my teens, we decided that we were bored and wanted to go somewhere. Our local strawberry patch has just opened, so we packed ourselves up and headed to the berry fields. Once we got back, I had to try and figure out what to do with all of these strawberries that we picked. Trust me, there were a ton of them! Some were short and plump, some were long and thing, and some were simply perfect. Recently, I cannot get enough of making cupcakes. I love to go in the kitchen, start a mix from scratch and make a delicious cupcake. It is so rewarding. With that beingsaid, I decided I wanted to make Strawberries and Cream Cupcakes. You are just going to love my cupcakes! They are so easy to make! Enjoy! -Add sugar, vanilla and strawberry extract to the butter until well combined. -Add egg whites, one at a time, mixing after each. -Add eggs, one at a time, mixing after each. -Add flour mixture to the wet mixture; alternating with the buttermilk on low speed until it is thoroughly blended. -Scoop the batter into the lined cupcake holders till 2/3 filled. -Remove to a wire rack until fully cooled. -Add 10 fresh cut washed strawberries (with stem removed ) to a food processor. -Add powdered sugar, 1/2 C at a time. -Cream both until light and creamy. -If not creaming slowly add a little whipping cream. -Mix the strawberry puree with the butter and powdered sugar. -Test to see if the frosting can make and hold a stiff peak. -Test by pulling out a spoonful of frosting holding it upside down. If it doesn’t drop then your frosting is done. -Test again to make sure the frosting can make and hold a stiff peak. -Spoon frosting into a pastry bag with a frosting tip. -Twist open end to push frosting to the tip. Add decoration of your choice to the frosted cupcakes. I hope you love my Strawberries and Cream Cupcakes as much as my family did. If you make it, make sure to share with us on Facebook or Twitter! Also, check out all of our other Dessert Recipes. Add sugar, vanilla and strawberry extract to the butter until well combined. Scoop the batter into the lined cupcake holders till 2/3 filled. Add 10 fresh cut washed strawberries (with stem removed ) to a food processor. Add powdered sugar, 1/2 C at a time. Mix the strawberry puree with the butter and powdered sugar. Test by pulling out a spoonful of frosting holding it upside down. If it doesn’t drop then your frosting is done. If not add 1/2 C powdered sugar. 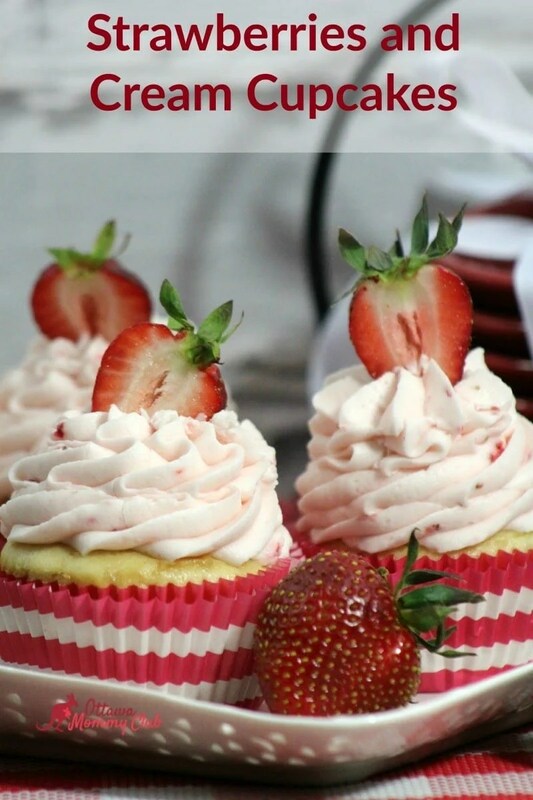 These look so good, I love using fresh strawberries in baked goods, makes everything taste so much better!! This is a great recipe to have this time of year. I love the all natural ingredients too! Perfect for this time of year when local strawberries are out. My husband loves anything strawberry so will have to make these for him. Looks delicious! I will have to try it for the Canada Day long-weekend! I love strawberries, and those look perfect for Canada Day! OMG I would totally love these. They sound delicious! I love the look and sounds of that frosting! Pureed strawberries! With fresh strawberries hitting our market, these would make a yummy treat! These look delicious and so pretty ! My cupcakes never look that good. Oh my goodness these cupcakes look and sound really yummy! Our family loves strawberries, so I’m positive they would be a huge hit with us, thanks for sharing. These look really good! Thanks for a great recipe! These look awesome Thanks for the recipe gonna make these; just bought the strawberries today. We have a fun party coming up next weekend ,I think I will try these!